The hardest won successes are best exhibited in the people themselves. One year ago, a 7.8 magnitude earthquake hit Nepal and international donors pledged $4.1B in aid. Yet today, even in the capital city of Kathmandu, piles of rubble are everywhere. Farther out in the country, in affected districts like Nuwakot and Sindhupalchok, countless piles of rubble remain of what were once houses as if the earthquake happened just last week. A combination of makeshift shelters, tarps, and kindly neighbors fill the significant gaps that exist between the need for, and the presence of, shelter for families and communities. Adding to the complexity of the recovery effort are Nepal’s disruptive politics that triggered tension over a new constitution and ended in a four month block of the border with India, preventing critical supplies of food and fuel from getting through. For regular people on the ground, this meant that at a time when they most needed help and subsidies, they instead encountered inflated food prices and 12-hour long fuel lines. This not only paints a bleak picture for Nepal, but calls into question the wisdom of international aid to poverty-stricken countries. On an individual level, this leads us to feel cynical and dubious when calls go out for assistance following a natural disaster. Out of the ashes of this struggle and seemingly insurmountable obstacles come countless stories of indefatigable resilience, hard-won success, and undeniable hope for good things ahead. While these examples may not solve the macro-issues, they impact the lives of individuals for the better and, as such, are significant threads in the tapestry of change. Find the organizations that have their sleeves rolled up, elbow deep in enabling this kind of change, and, suddenly, the possibilities for impacting the lives of individuals--and ultimately a society--are limitless. One example is a small international disaster relief NGO called All Hands Volunteers. 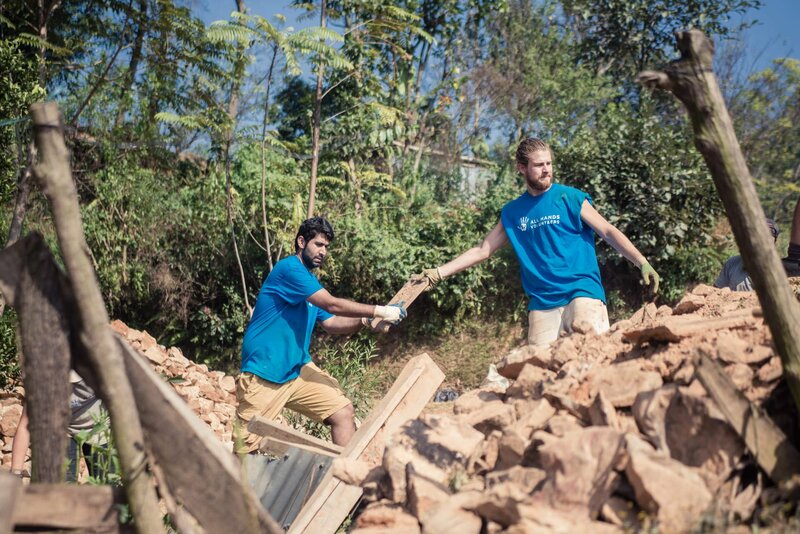 Their model is to transform the energy and good intentions of any volunteer from anywhere in the world into positive outcomes by providing a place to stay and the logistical, training, and supervisory support needed (free of charge) to change a pile of rubble in Nepal back into a home or school. Using this model, All Hands Volunteers has cleared rocks and debris for 359 sites, rebuilding 100 homes and impacting 20,000 Nepalese. They have since turned their attention to schools, initially building 16 temporary learning centers and now constructing 5 schools – including a total of 80 classrooms in the hard hit Nuwakot district of Nepal. The hardest won successes are best exhibited in the people themselves. Over my three trips to Nepal this year, I have seen an irrepressible tenacity and spirit of hope among the Nepalese that is both humbling and encouraging. I visited a village, near the Tibetan border, that was completely destroyed. When I arrived, I was greeted by all the children of the village and the school committee who showed me their school, currently consisting of two rooms made of tin and tarp. For more than two hours, local townspeople passionately explained their five-year strategy to not only rebuild their school but to continue to grow and improve the quality of (and access to) education for their children. I’ve watched in awe as grieving fathers and mothers, after losing children in the earthquake, try to lessen the burden of a volunteer by sharing their sparse food with us, working side by side with us, or spreading a blanket for us to sit on. I’ve similarly had the privilege to spend days with volunteers from around the world like David, from Italy, who has spent the last seven years volunteering to help people in need; and Jessica, from the US, who had never taken an airplane before she flew to Nepal a few months ago to help after the earthquake; or Rafe, a 70 year old from the UK, who is as strong as an ox with a heart to match. There are thousands of stories just like these, affecting people and families all over Nepal. And while examples of failure are frustratingly prevalent throughout the recovery effort, so too are stories of resilience, strength, impact and hope. W. Clement Stone once said, “Big doors swing on small hinges”. So they always have, and so they will in Nepal. And if organizations like All Hands Volunteers have anything to do with it, those doors will swing wide open. All Hands Volunteers is the leading disaster relief organization powered by volunteers. Over the last decade, they have enabled more than 35,000 volunteers from all over the world to donate 175,000 days across 64 disasters. Learn more at www.hands.org.